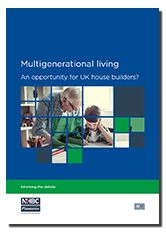 Multigenerational living: an opportunity for UK house builders? This report analyses recent evidence on the scale and character of multigenerational households in the UK, and gives detailed insights from those who have experienced this lifestyle. It identifies a growing trend towards multigenerational living, and a range of practical benefits that could have wide resonance with the public. This represents an important potential marketing opportunity for house builders, many of whom build homes which, with little or no modification, can provide suitable accommodation for the most common categories of multigenerational households. Background and introduction – illustrated definition of multigenerational households, showing different makeup and size of households, including three-generation and two-generation categories. Methodology for the research – five elements including: Review of existing evidence and literature, analysis of existing data from the ‘Understanding Society’ survey, review of existing designs, interviews with multigenerational households and major house builders. Extent and character of multigenerational living in the UK – shows the estimated proportion and number multigenerational homes in the UK, and the prevalence of different age categories within the mix. Also considers the distribution of multigenerational homes according to ethnicity, the size of multigenerational households, household income, typical property sizes occupied and tenure. Designing homes for multigenerational living – this section, using a series of plans, considers a number of home designs that are currently suitable for multigenerational living, or that with some modification could become suitable. Also, for comparison, shows homes that are specifically designed for multigenerational living in the USA and Singapore. Experiences of multigenerational living – Practical experiences from households who have embraced multigenerational living. Includes consideration of the overall drivers of multigenerational living, financial arrangements, positive aspects of this style of living and the key requirements identified by households. Implications for house builders – summarises feedback from house builders on their views on the market for multigenerational homes. Gives a summary of the range of opportunities for house builders. Size of multigenerational households: the majority of multigenerational households are smaller than often portrayed. The most common household size is just three people. Such households do not necessarily require large homes to live together comfortably. Many existing designs may be suitable for these households. Trend towards multigenerational living: in the UK approximately 125,000 families per year are adopting a multigenerational lifestyle: a significant potential opportunity for UK house builders. Social benefits: Though not everyone’s choice, families that chose a multigenerational lifestyle recognised social advantages including having more family time together, social contact and support for younger and older family members in particular. Opportunities for government: multigenerational homes potentially contribute to more efficient use of housing and could play a part in addressing some of the immediate social and health challenges faced by the nation.